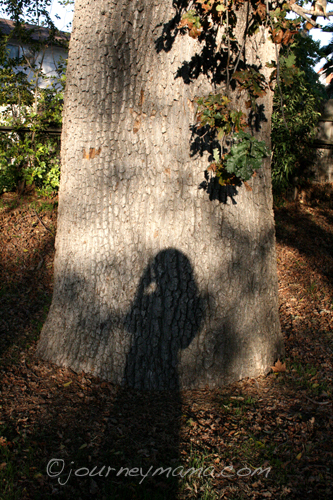 Self-portrait with oak tree, originally uploaded by journeymama. That was a little raw. Sorry. A lot is hitting me, now. And I feel like maybe hiding is the only option, but I have forgotten how to hide, I think. I tend to just wander around my house, instead. It's good that we don't have a T.V. I think it would be too much of a temptation, right now. You may never see me again. You already know that my grandmother is sick. I want to go back to the center of my childhood, where Grandma wasn't sick, where she was formidable and fiercely loving. I want to go back to my wedding, where she shook a finger at Chinua and said, "You are getting someone very PRECIOUS to us," and he took a step back, because you don't mess with that. But time doesn't go backwards. Somehow we will go forward. The Land closes in Escrow this week. Many people, most of whom are not necessarily directly involved, are not happy about the people who are buying it, although personally I think that what is, is. Chinua and I have borne a bit of the brunt of the disappointment of many people, these last few years, and sometimes I feel it vibrating even in the voice boxes of people I talk with. Almost like an embarrassment,- like when you turn your head when you see someone with a disfigurement, not sure of which way your eyes should go. My anxiety rears its ugly head. People tell me not to take it on, but I feel like I don't really even know how to do that. All I know is my own hunched shoulders. I think I will have to look again, to the strength of God, and find my rest, again, in His large calm. Of course. I mean, I don't even think, I know. And here I am okay, no matter what changes fly up at me, here is love, an invitation to come into this house, you are welcome here, we like you. Sit here, grief is natural, let me touch your hair with the gentlest of touches.